Working with clays | Nascent Naturals Inc.
Clays are commonly used in a wide variety of applications, everything from facial masks to first aid. In aromatherapy, the primary use of clay is to draw out and remove impurities while stimulating circulation. Some clays such as dead sea mud and pumice powder provide exfoliation. Most of the time, clays are mixed with a non-drying base like lotion, cream or glycerine for normal and dry skin types. For severe oily skin conditions clay powder can be mixed with water only. We carry bentonite, red, white, and green clay as well as pumice powders. 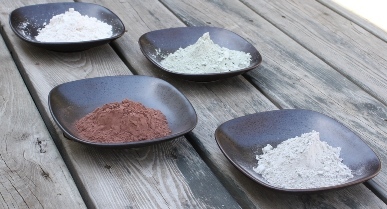 Here is a little bit of information on these clays and powders with a quick recipe. Bentonite is part of the smectite family. Its common name Bentonite, is in honour of Fort Benton in Wyoming where it was first discovered. Bentonite is used extensively in health products. Its ability to expand and absorb up to 40 times its weight in toxins makes it a must have in any spa toolkit. Bentonite is generally mixed with other clays to slow its absorbing action. Red clay gets its name from the high concentrations of iron that give this clay its colour. It is often used as a skin toner with an aggressive pulling detoxification action. It is generally mixed with other clays (less than 30% of red clay) to soften the pulling effect. Green clay is primarily made up of chromium, nickel and copper. Generally, it is a good clay for most skin types. On oily skin it has good results by helping to reduce sebum production without stripping the necessary skin oils. White clay, also called, Kaolin clay, is a delicate powdery clay from China. It is used for sensitive skin or may be added to other clays to tone down their effect. Pumice powder is made from pumice rock, a light coloured, frothy volcanic rock formed during volcanic eruption as escaping gases from cooling lava leave millions of holes in the rock. The cooled rock is so light it floats on water. Pumice is used extensively in exfoliates, hand soaps and other cosmetics. Our fine powder makes an excellent, gentle exfoliate. I prefer mixing clays with lotion or cream to help moisturize the skin and prevent the clay to dry out before the recommended treatment time. One helpful tip I have found from experience – make sure you add enough clay to the mixture. The mixture should be thick and easily spreadable to create even moist (not wet) covering on the entire skin area under treatment. Mixtures should be left on for at least 20 minutes to have any effect. Add some pumice powder to your preferred base (or carrier) such as liquid soap, gel, cream, or lotion to create a luxurious exfoliant. 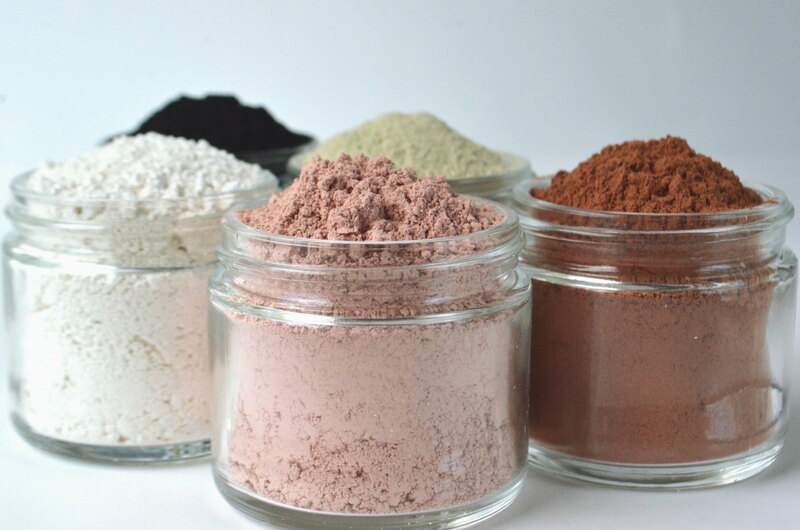 In a separate container mix up a blend of 75% bentonite clay powder and 25% red clay powder. For additional exfoliating effect add a small amount of of dead sea mud powder.